Azimuth conducted a complex ecological risk assessment (ERA) at the Pinchi Mine to evaluate potential ecological risks in both aquatic and terrestrial environments as a result of contamination from historic operations. Since the mine is located in a naturally mercury-enriched area, the ERA recognized upfront the importance of understanding background mercury exposure (i.e., to distinguish between possible mine-related contributions to the surrounding area versus naturally occurring mercury). The ERA involved comprehensive desktop studies (e.g., literature reviews, modeling) and field programs carried out over several years. This work, which was specifically designed for evaluating and guiding the mine’s closure plan, greatly benefited from input by members of local First Nations. 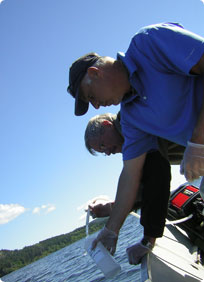 In addition to risk assessment work, Azimuth also completed numerous aquatic studies over the past decade, including a comprehensive study conducted in 2006-07 and 2016-17 to further characterize the ecology of Pinchi Lake and document regional fish mercury concentrations.